Asha Stanford, the organizer of famous Stanford Holi and Asha SV, the organizer of the Team Asha, present to you Asha Dandiya 2015 @ Stanford on October 17th. Hope you are all excited about Asha Dandiya 2015! Dance lessons start at 6:30 pm. Cash recommended for food purchase. Student tickets require SUID for entry. Lookout for the selife booth, brought to you by Selfiestall. With the disco-style DJ, we promise that you would never want to stop dancing! And don’t forget to flaunt your beautiful ethnic Indian costumes! Like us on FaceBook: facebook.com/AshaDandiya and invite your friends too! All proceeds from this event will directly benefit the Borderless World Foundation, an organization supported by Asha for Education, that has been transforming the lives of orphaned girls in the Kashmir valley for more than fifteen years. With a proven track record, the organization aims to double the number of girls it supports by building a home in Kupwara, Kashmir. Come play dandiya and give these children a hope for a better future! Join hands with Asha for Education to help BWF build the home of the orphan girls by donating towards this project. *Asha for Education is a non-profit organization dedicated to the support of basic education in India. 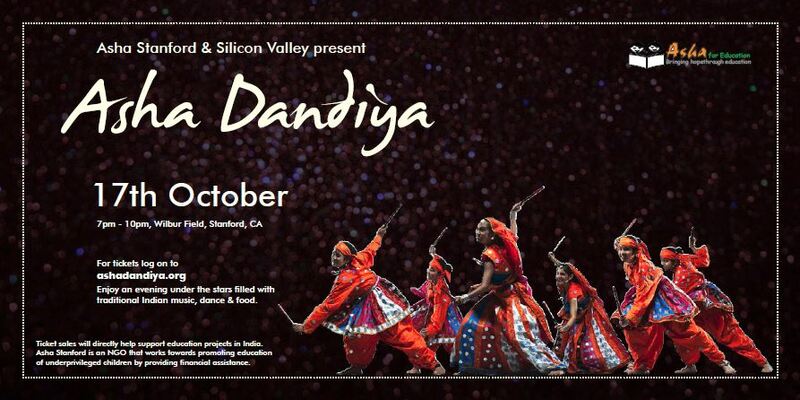 Proceeds from Dandiya will go towards funding education projects for underprivileged children in India. Asha for Education is a fully volunteer-run 501(c)(3) non-profit with 50+ chapters around the world whose mission is to catalyze socio-economic change in India through the education of underprivileged children. We work with over 300 projects spread across the length and breadth of India. The projects deal with educational issues from pre-primary schooling to professional education in locations from urban slums to isolated rural areas. You can help us in our mission in a variety of ways. You can join a local chapter, get involved with projects in India at an intimate level with the Asha Stars program, help us with our fundraising efforts, visit a project in India, intern with us or our project partners or Donate! Contact the chapter nearest to you! Or contact the coordinators of the region you are in. See here for details. Asha for Education is a registered 501(c)(3) non-profit charitable organization.